If you ask any Ubuntu user that's how Windows look through his eyes, you will surely get this answer “I don't know why you use this but it looks awfully boring”. That might be true as comparing with Mac and some LINUX OS, Windows 7’s user interface is a little bit down (Windows XP can't even stand beside those). I'm not talking about how user-friendly the UI is (it might depend on users experience and choice) but if you want to change your Windows interface and make it like Ubuntu, then Ubuntu skin pack might help you. Ubuntu fans who for some reason happen to use Windows 7, are in for a treat with a wonderful Ubuntu Skin Pack released by user hamed. This is the same developer who has previously brought us the Mac OS X Lion Skin Pack and Windows 8 Transformation Pack. 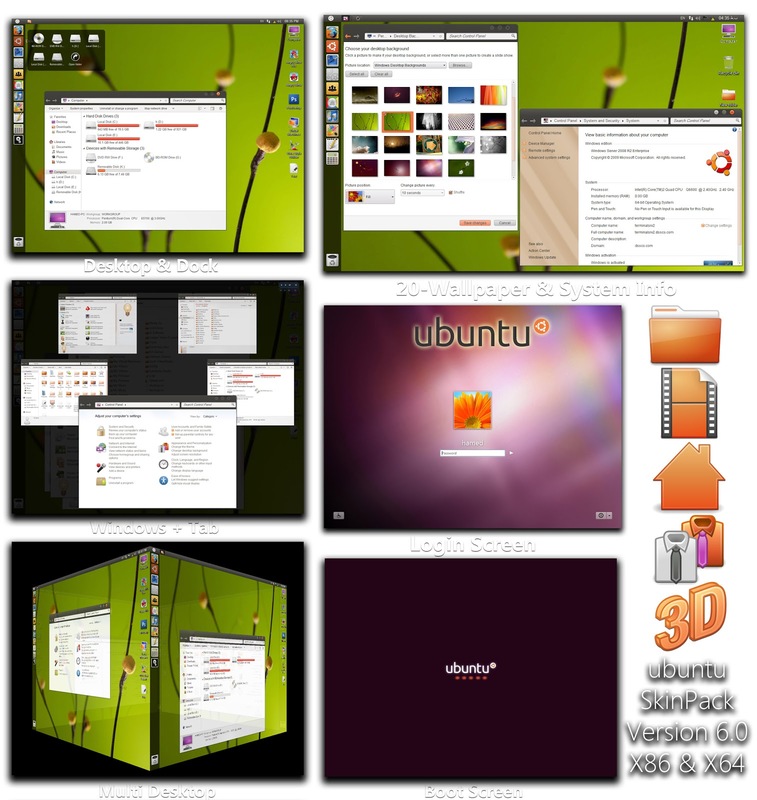 Like the former two, this Ubuntu 11.04 transformation pack does not require any third-party theme patching application. Just launch the .exe file, select the desired options and install the theme with a simple installation wizard. This is a great one we have found yet. We might already seen this interface on our screenshots. Let's make a ride through it. This application is easy to install. You don't need any third-party tools and patching to use this (though CustoPack will require). First off, you should download the setup file to a place where you can easily find it. Once the download completes, head on over to that folder and double-click the setup file to launch it. The setup itself is easy and doesn’t really have any hidden items with it. Just click through it, making sure that everything is selected in order to get the full experience. While the setup is doing its thing, it’ll eventually poke you about installing a component that it needs for smooth operation. Go ahead and click yes so that it’ll automatically install and download that component for you as well. When the entire setup completes, go ahead and restart your machine. The system that will change everything from the bootup menu to the shutting down screen. This will change your logon screen, bootup screen, icons, start menu and taskbar………….that means everything. This package comes with some cool applications. Like Yodm3D 1.4 (this will allow you to create a virtual 3-D experience), SmartFlip (you can use this to switch between active Windows) and RocketDock. Overall, the Ubuntu Skin Pack is a great way to get that Ubuntu feel when using Windows. Although it’s not completely free of kinks, I hope that the developer can continue working on it so that it’ll feel like an A+ solid product. That being said, it’s already a great product as it is. Most themes or transformation packs rarely come close to this. To view the full interface, just click on the below image.